The Ascendant is the exact degree in the zodiac which was on the eastern horizon, or rising on the horizon at the exact time of ones birth. The term Ascendant and Rising sign are interchangeable. As the Earth revolves, this point constantly changes. Every 4 minutes the degree of the Ascendant changes. The Ascendant and the Sun sign are considered equally important. The Ascendant influences the appearance and many outward traits of a person. The Ascendant also represents traits that the individual is inclined to be striving toward. The Ascendant and the first house of the horoscope are about the self. This is the most personal part of the horoscope. Planets near or in the Ascendant define characteristics about the personality. The Medium Coeli or the Midheaven is at the top of the horoscopic chart. It is the point further south in the zodiac. 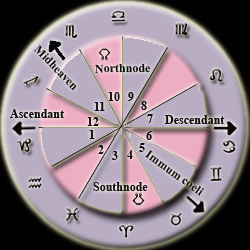 The Midheaven point is the cusp of the 10th house. The Midheaven represents ones most exposed position, his public status, and how he presents himself to the world at large. This position is associated with the career. "The Descendant is a point opposite to that of the Ascendant in the horoscope chart. It is the degree of the zodiac residing on the western horizon at the moment of birth. In the chart this point marks the cusp of the 7th house and the beginning of outward expression. Houses 1 through 6 have had a personal tone, but now they will begin to relate to our interaction with others. The Descendant suggests how you relate to those nearest to you. The seventh house is sometimes called the house of partnerships and marriage. It is very fortunate when your partner's Ascendant is in the same sign as your Descendant because this mirror image of each other produces the most constructive spousal and compatible relationships. The Imum Coeli or Nadir is opposite the Medium Coeli. This is the lowest point on the horoscope and the point furthermost north in the zodiac. The Imum Coeli is the cusp of the fourth house. This is the area of our deepest concern for security and shelter. This is concerned with home, traditions, stability, and nurturing. This is where you seek comfort and protection. Your activities here will be private and concealed. When many planets are near the Imum Coeli , accomplishments may not get the notoriety they deserve.